to the U.S. Army Corps of Engineers within the public comment period ending May 30, 2019. The UK's Guardian newspaper covered our feature length documentary, which held its World Premier April 6th, 2013, at the Finger Lakes Environmental Film Festival and won the Triangle Award at the Columbia Gorge International Film Festival and the Arches Award at the Moab International Film Festival. Bobby Andrew, a Yupik elder and spokesmen for Nunumta Aulukestai (Caretakers of Our Land) and a central character in the film spoke before screenings at the Seattle Social Justice Film Festival and the UK's Native Spirit Film Festival. The film also screened at the Salmon Film Festival in Fort Bragg, California, in the University of Michigan's Social Justice Film Series, at the Americas Latino Festival and at The Bellingham Human Rights Film Festival. The Just Film Festival in Vancouver, BC. hosted the film’s Canadian Premier and are screening the film across Canada with their touring festival. The Anchorage International Film Festival Awarded our film second place in their Snow Dance competition for "Best Alaskan Filmmaking." 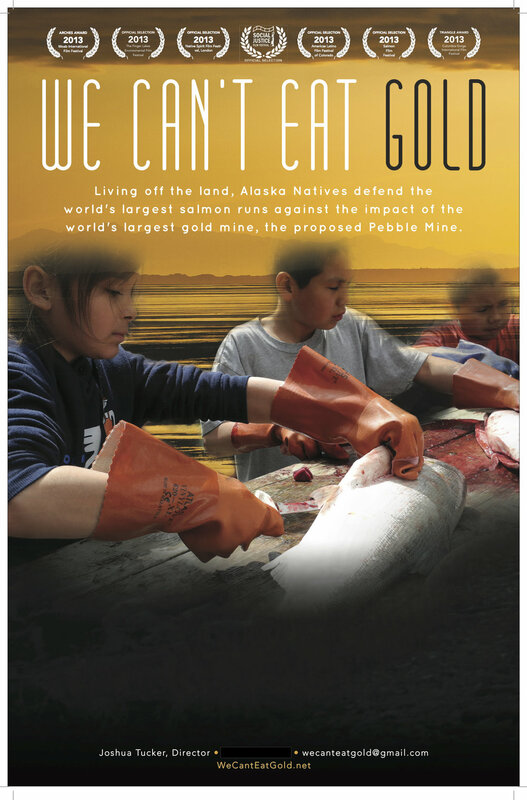 Living off the land, Alaska Natives defend the world's largest salmon runs against the impacts of the world's largest gold mine, the proposed Pebble Mine. The Army Corps of Engineers will soon decide if they’ll permit Pebble Mine. Watch families fish, as we open a space for tribal elders and youth to share their ways of life. Now that we’re giving away our film We Can't Eat Gold for free, please share the film with as many people as you can. People can share these stories of Bristol Bay's 'salmon way of life' so that Alaska Native voices are heard before the public comment deadline on federal permitting of the proposed Pebble Mine, May 30th, 2019. Empowering communities with educational tools is our goal, not making money. Please help share this free resource before the Army Corps of Engineers public comment period ends. Download Printer Ready File. Magnify, then, right click or control clock on the enlarged image. Feel free to use a text box to add your screening time, date and location info. The official Facebook fan page will share your event if you send a Facebook message. You can also tag it in your posts to connect people to more information. The official trailer is another good video to share to remind people about your event. Director Joshua Tucker can be reached at wecanteatgold@gmail.com. He s often available to speak at screenings via Skype and other apps.